Alex and Ariel push back against this standard of 'Lifetime soap movie of the week' indie fare and construct chaotic, tumultuous (i.e. rocky) situations that feel authentic and have real consequences. This is also a credit to the wonderful acting work done by an up and coming ensemble cast. You will laugh, you will cringe, and crying is optional because these directors give their audience and cast enough credit to react appropriately to the world they have created. 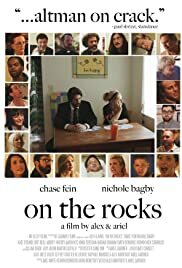 If I had to sum up On The Rocks in lay terms, I would say it is like if Robert Altman had smoked crack cocaine and made a movie.